We’ve all watched them…those YouTube videos of a bride accidentally falling off a pier or tripping into a mud puddle. From the look on her face, it’s clearly not the destiny she’d envisioned for her gown. But we’ve also seen images of a bride who’s filthy or soaked, and she’s grinning. 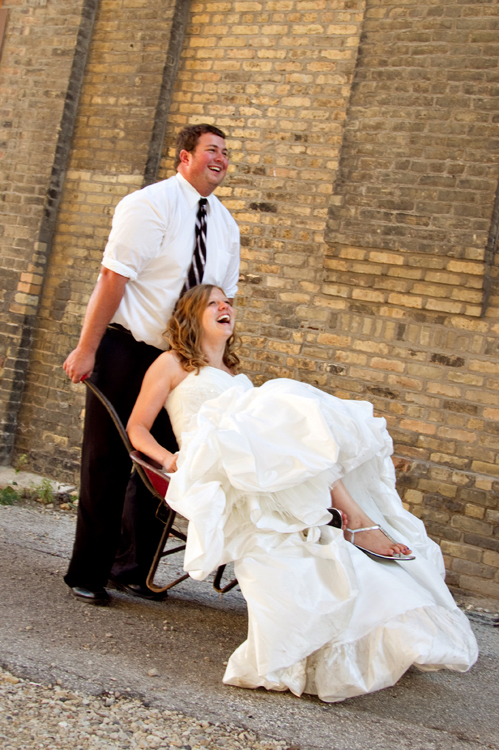 Either she’s a great sport, or she’s just had a trash the dress photo shoot. If you’re thinking about trashing your own dress, here’s what you need to know. Quite simply, your trash the dress shoot can take place wherever you like. Consider incorporating meaningful locations (perhaps the spot where you met or married) or your hobbies, and if you’re going to invite your new husband, maybe you’d want to do something you have in common. Stevens says lots of people like to go to the beach because it’s literally “taking the plunge,” but she also suggests canoeing, fishing and even four-wheeling in the mud. At home, you could cook up a feast, play with your pet or work in the garden. You could also showcase the season. In spring or summer, try to schedule the shoot while it’s raining. And in fall, what could be more charming than playing in the leaves? Have a snowball fight or build a snowman in winter. Someday, Stevens even hopes a bride will want to do the New Year’s Day Polar Bear Plunge in her gown. “No takers yet, but I’m determined to find someone who’s game!” she says. Brides normally wait for a bit to trash their dress, whether it’s so they can take a honeymoon or just let life settle down. For example, newlywed Anne Kielisch of Cedarburg scheduled hers for a few weeks after her wedding so she could show off her new short and sassy haircut in the photos. Like each bride, each trash the dress photo shoot is different, but here’s what some trash the dress veterans have told us. “We had a sunset wedding ceremony, so we took pictures trashing the dress in the ocean the day after the ceremony,” says Jenni Hellpap of Menomonee Falls, who had a “destination wedding-moon” in the Dominican Republic, where Stevens was the photographer. 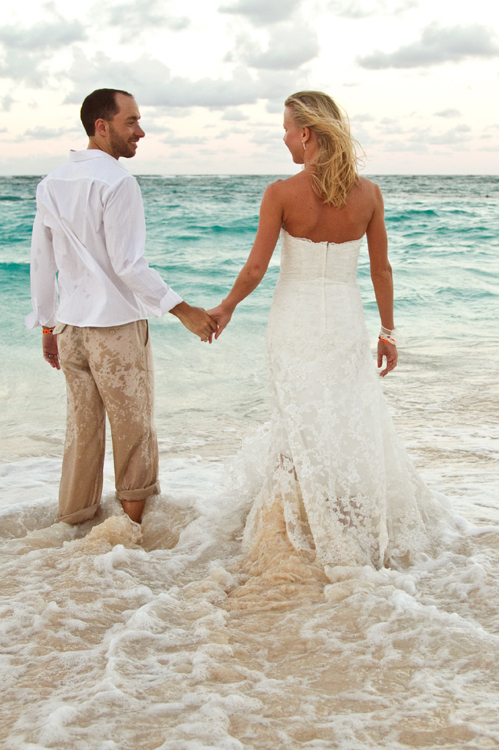 “I was in the ocean with my dress on taking pictures with my new hubby, so it was funny any time waves came in and hit us. Some were bigger than others, so they caught us by surprise, and I started going out a little too deep and had to rein it in. It was a blast dressing up all fancy and pretending to be a model for a day.” That’s one of their photos, above left. “I brought my dress and a bunch of different accessories, from boots to earrings to big hair accessories that I made,” says Kielisch (below left). “My photographer [Jerusha Schoenhoff of jruimages], her assistant, my friend and I went to a bunch of locations to get different shots,” including a river, junkyard and an old train station. She really enjoyed her photo session, which lasted about six hours. “The pictures I got were amazing and I have to admit, I prefer them to my solo wedding shots,” she says. If you’re worried about actually trashing your dress, don’t be. Unless you’re planning to get fire or sharp objects involved, chances are that with a good professional cleaning, the gown will come out virtually unscathed. “There is not any visible damage to my dress, and we took some of my most favorite, amazing photos in the ocean,” shares Hellpap. When it comes to the images, photographers like Stevens are set up to fulfill just about any request, from large canvas or metal prints to an album dedicated to the shoot. “I’ve got them hanging up around our apartment, in photo albums, on Facebook and in frames at my office,” Hellpap tells us. So, tell us! Will you be trashing your dress?